Last weekend I went to London with my mum and sister to visit my brother who is at university there as well as meeting up with other friends and doing fun tourist-y things. I am going to do several posts on the trip with a load of photographs and some advice for anyone thinking of going to London for a few days. You pack so much into 4 days! I took these photos on the Monday outside the British Museum, the building itself is incredible! Moving on to the outfit. The coat I bought on Sunday while browsing though vintage shops and market stalls on Brick Lane for £20. 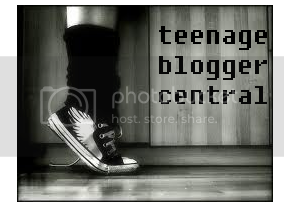 It's from a place called the Vintage Market, which is a massive underground vintage clothes shop. I just adore it, I have been looking for a tweed coat for ages and this is just so cute! I love the low-waist and cute pockets. The crop top is from Topshop and the skirt is a few years old from a local shop which has now closed down. 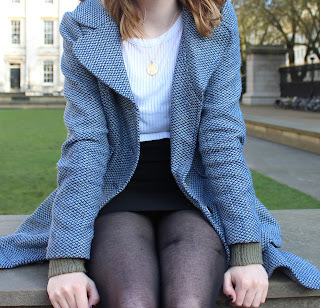 The cardigan (Underneath the coat) is from Penneys/Primark and I wore it in this post. I'm also wearing a cute coin necklace which I found in a vintage jewellery stall also on Brick Lane. Earrings are from Penneys/Primark. Nail polish is by Barry M and Lipstick is Rimmel's Kate Moss 107. I just love this outfit especially the coat. Let me know what you think. Hope you enjoyed reading it! Thank you Rachel :) Yeah we should all take a trip next summer and stay in a hostel or something :) I feel like an expert of London now!